Doyle Wins -- Again! With 10-2 -- Again! 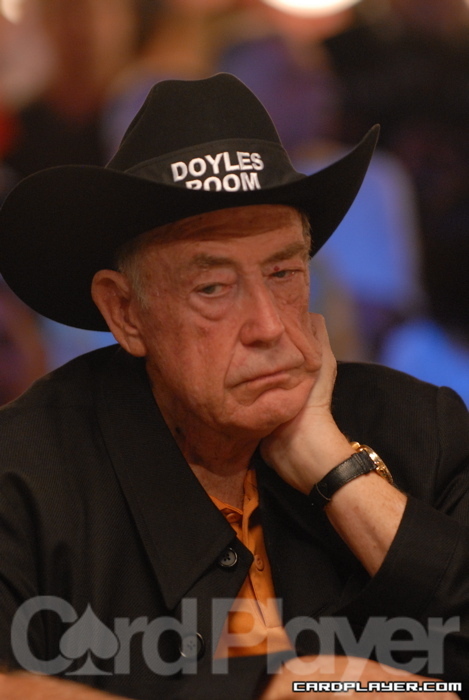 Doyle Brunson picked up in 1977 right were he left of the year before. He took down his third gold bracelet by winning the preliminary seven-card stud eight-or-better tournament before gearing up for the main event. Bobby Baldwin also broke out onto the World Series of Poker scene by winning two gold bracelets in preliminary events. He won the $10,000 deuce-to-seven lowball event and then claimed the top prize in the very next event, the $5,000 seven-card stud tournament, to go back to back. This would be unheard of at the WSOP of today, although Jeff Madsen did come close to that feat in 2006. Another new feature in 1977 was the first-ever WSOP ladies event. Tournament Director Eric Drache added the event to the schedule, and it was a $100 buy-in seven-card stud tournament that attracted 94 participants. Jackie McDaniels won the inaugural bracelet, and some form of ladies event has become a feature at the WSOP ever since. Brunson made another strong run in the main event, and he made a large step toward defending his title when he picked up a huge pot with suited connectors late on the third day of action. Brunson busted both Buck Buchanan and Ed “Junior” Whited from the tournament on the hand and picked up 140,000 with trip sevens. The final four players in the event were Milo “Sioux Falls Slew” Jacobson, “Sailor” Roberts, Gary “Bones” Berland, and Brunson. Roberts was sent to the rail in fourth place when his pocket eights ran into the pocket kings of Jacobson, and Jacobson followed suit in third place when Berland disposed of him with a straight. Brunson then slow-played a pair of queens in the hole against Berland and knocked out one of his legs. He doubled up through Berland on the hand to survive and take a substantial chip lead. The final hand was a pleasant trip down memory lane for Brunson that also led Berland to steam for hours into the night. Brunson was dealt 10 2 in the hole, and Berland received 8 5 . The flop hit the table 10 8 5 , and Berland checked his option. Brunson checked, as well, and the 2 hit on the turn. Brunson led out with a bet. Berland pushed all in, and Brunson quickly called. The 10 on the river added insult to injury for Berland, and he finished in second place. Brunson had won the world championship for the second year in a row with 10-2 in the hole, and those cards are now known to the poker world as “Texas Dolly.” Brunson earned $340,000 for the win, along with his fourth gold bracelet, and he put that money to good use. Brunson spent the prize money on the publishing costs for the book that is now considered the bible of poker strategy books, Super/System.